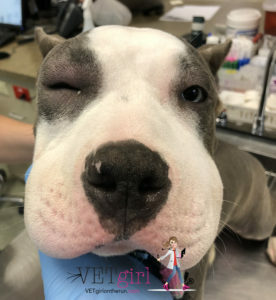 In today's VETgirl online veterinary continuing education blog, we review how to treat the allergic reaction in dogs (and rarly, cats). If you have spent any time working in the small animal veterinary ER, you have probably treated your fair share of allergic reactions. Cats and dogs may suffer an allergic reaction as a result of a variety of triggers including insects, dust, foods, chemicals, etc. Type 1 (acute anaphylaxis): In these cases we see an acute-onset swelling affecting especially the head and ears, urticaria (hives), anaphylaxis, and even the potential for death. Read HERE for information on treating anaphylaxis in veterinary medicine. Type 2 (cytotoxic): Examples of this type of reaction include Immune-mediated hemolytic anemia and immune-mediated thrombocytopenia. Type 3 (immune-complex): In these cases we see a cutaneous ischemic vasculopathy often following an injection (e.g. vaccination) with the potential for additional or distant sites of disease including the ears (ear tips), footpads, and tail. Type 4 (delayed-type hypersensitivity): These reactions are cell‐mediated, and also are usually the most delayed reactions, with a mean time of onset of 2 weeks. Examples include erythema multiforme and contact dermatitis. Pruritis - most pets will appear itchy. Facial swelling - it is very common to see swelling around the eyes (periocular) and muzzle (lips). Other signs of an allergic reaction may include agitation, panting, or even vomiting and diarrhea. Understanding the need to assess each patient individually (e.g. if they are currently on any medications, history of illness, etc), how would I treat the uncomplicated allergic reaction? I would consider an anti-inflammatory dose of corticosteroid (e.g., 0.5 mg/kg of Prednisone PO or 0.1mg/kg DexSP IM or IV. I would also consider treatment with diphenhydramine (Benadryl), 2–4 mg/kg orally or 2mg/kg IM. Diphenhydramine 2mg/kg PO BID-TID for 3-5 days. The information provided on this site and on this blog is for informational purposes only and is not intended as a substitute for advice from a health care professional nor should this be considered a treatment recommendation. The materials presented are not intended as medical advice for individual problems. You should not use the information on this site for diagnosis or treatment of any health problem or for prescription of any medication or other treatment.